South Korean political parties across the aisle voiced their stances on the latest pop culture controversy involving a boy band and a certain T-shirt. Japanese broadcaster Asahi on Thursday canceled BTS’ scheduled appearance on its music show “Music Station,” citing a certain T-shirt worn by a member of the band as the reason behind the decision. The T-shirt featured images and phrases linked to South Korea’s liberation from Japanese colonial rule in 1945 -- including a photo of the atomic bombing of the Japanese city of Hiroshima. Following Asahi’s announcement, Japanese television stations Fuji TV and NHK said they would either withdraw or reconsider BTS’ appearance on their respective music shows, triggering debate online and in the media. Since these announcements, reactions to the touchy subject for the two neighboring countries have been polarized. 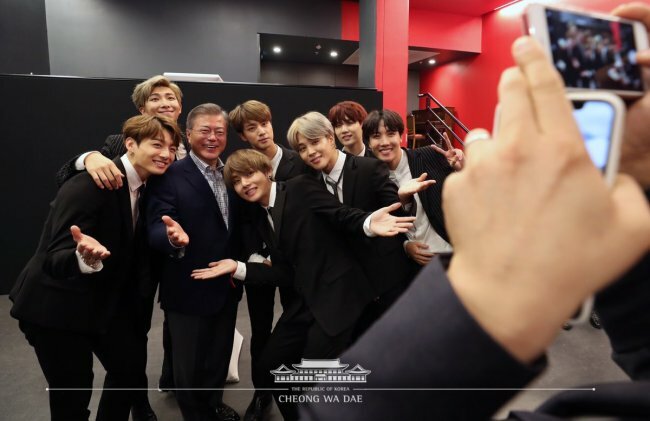 Some extreme opinions accused BTS of being “anti-Japanese” and “atomic bombing sympathizers,” rehashing the band members’ past social media posts celebrating Korea’s National Independence Day. Others took to Twitter to counter the controversy being branded as “the atomic bomb T-shirt” with the trending hashtag #LiberationTshirtNotBombTshirt. The latter group pointed out the historical context of the atomic bombing, which had a direct association to Korea’s liberation from Japan. South Korea’s ruling and major opposition parties weighed in on the T-shirt debate, each issuing an official stance Saturday. The party’s chief spokesman Yoon Young-seok pointed out that Japanese viewers -- notably those leaning far-right -- have a history of punishing local networks for airing Korean pop culture content, citing backlash against Fuji TV’s Korean content-heavy program schedule in 2010-2011. The band’s representing label Big Hit Entertainment followed up on the news on Friday on its official Japanese website after Asahi’s announcement, promising “to meet with fans with better music and performance next time.” The statement said the decision was “unfortunate,” but did not mention the exact cause for the cancellation.